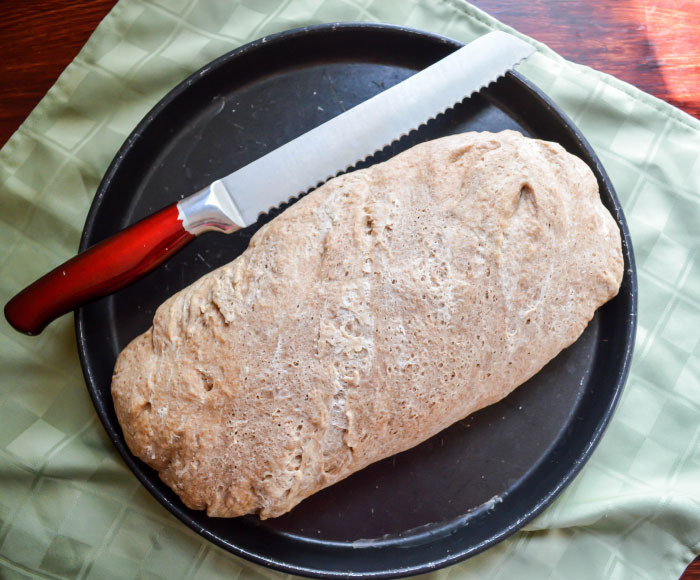 Who doesn’t love a fresh slice of hot-out-of-the-oven homemade bread? Certainly we do. We are by no means gluten-free over here in the Norris household (three days until that’s officially my name!). We’re both runners. We’re both English/German heritage. It’s in our blood to eat carbs, especially in the form of bread. 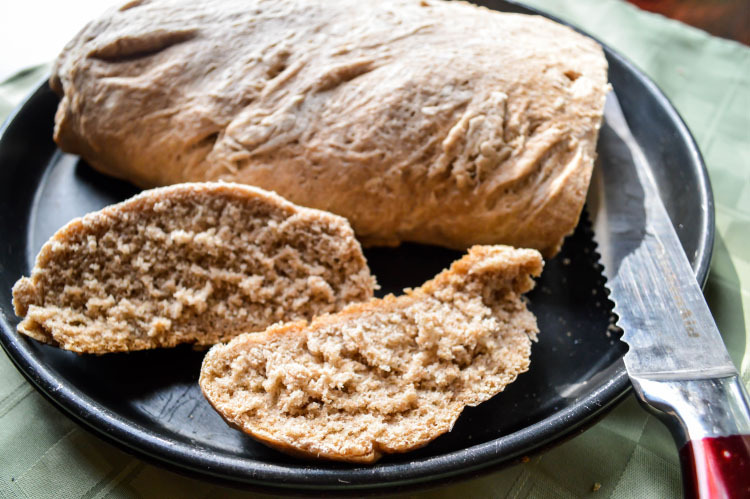 Homemade whole wheat bread is a staple in our household. I can’t even remember the last time we bought bread from the stores, because this bread is so easy to make and just tastes so good. Sometimes we go through a loaf in only three days – sandwiches for lunch, slices for snacks, toast with our salads. Honestly, this bread is one of my domestic prides and joys – I can consistently make a delicious loaf of bread for us. It makes me feel like I’m Pioneer Woman. I took me a couple of years to perfect a recipe for homemade bread. I started making my own bread when I started graduate school back in 2012. When I was still in undergraduate I became obsessed, as all twenty-two year old girls did, with Pinterest. Like, hours a day on Pinterest level of obsessed (I wish I was exaggerating). The last semester of my senior year of college was somehow surprisingly unchallenging. Despite taking both Hebrew and Latin, applying to master’s programs, traveling to Detroit frequently (Ryan used to live in Grosse Pointe a couple years back), and working three on-campus jobs, I had way too much free time. Even with how much time I wasted on Pinterest, I still needed hobbies to keep me occupied. So I started running longer distances – up to 8 miles on day that my classes started later. Even then, I still had free time – only now I was hungrier. I started hunting down recipe ideas on Pinterest. My mom got me a KitchenAid stand mixer and a KitchenAid food processor for Christmas, and I was beyond eager to use them. So I began: homemade hummus, homemade almond butter, homemade cookies, homemade cakes, homemade crackers, and homemade bread. Of all these goodies, I could not quite master homemade bread while still in undergraduate. I could not make my yeast rise just right, and most of all I struggled to find the right recipe. I had my requirements: that it be whole wheat, that it work well for sandwiches, that it be simple enough to make weekly. So my trial and error search for the perfect loaf of bread continued as I moved myself and all my baking supplies to Dayton, Ohio. I’m a competitive person, most of all in running but also oddly in homemaking. When I learned that many of my fellow master’s students made their bread, I was even more determined to perfect it. If they could do it, I could do it! So off I went – whole wheat loaves filled with flax and chia seed, white Italian baguettes, bread bowls, bagels, just loaves and loaves and loaves of breads. Some of these were successful, especially the bread bowls (which I really should make again soon). 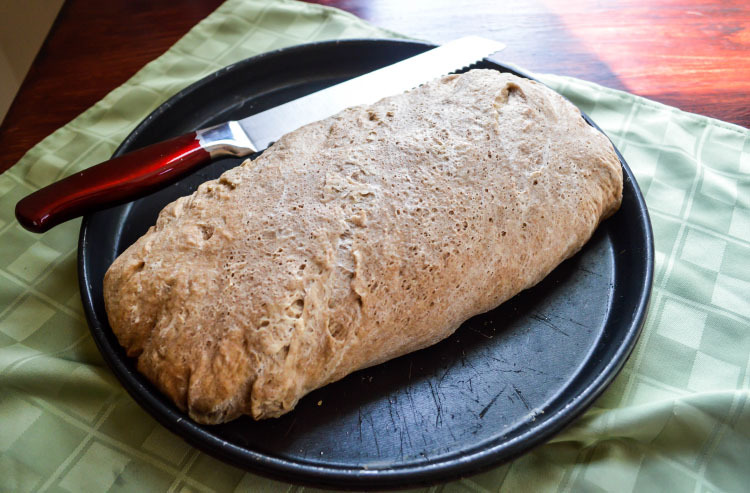 I did though frequently encounter all the normal failures – burnt bread, overly dense whole grain bread, dough that never rose and became a pizza crust. Graduate school somehow flew by in two stressful and sleep-deprived years. 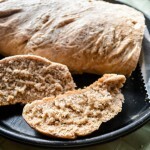 During my final semester, when I was home most of the time working on my master’s thesis, I intensified my search for the best whole wheat bread recipe. This winter was, after all, the Polar Vortex winter, so I had plenty of time inside to bake. I’d research, then take a break to start the bread; let it rise and write until it was ready for the oven; while it baked, I’d revise that day’s work. It was a great system, actually, since the end of a long day of researching and writing and wading my way through fourteenth centuries texts was rewarded with a piping-hot loaf of bread. 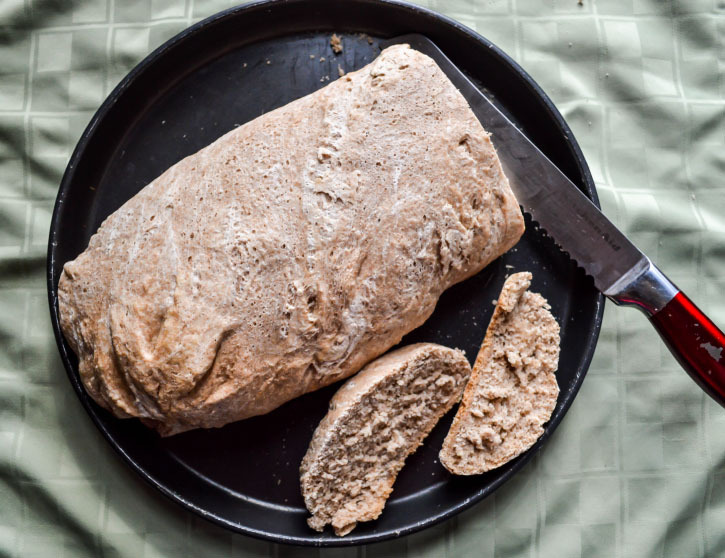 During that writing and baking process, I finally found the right whole wheat bread recipe – this one from Real Simple. Of course, as you repeatedly make a recipe, you discover little ways to adapt it to your own preferences. After two years of bread baking failures, I had learned all the little tricks to make the perfect loaf – how to get it to rise well, how to shape it, and how long to wait for it to cool before cutting it (but I always cut it too early, because I somehow have the patience to let it rise for two hours but not to let it cool for 15 minutes). 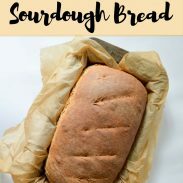 Over time, I increased the ratio of whole wheat flour in the recipe and replaced the all-purpose flour with bread flour. I find that bread flour helps the dough rise even more (hence the name), especially if you are using whole wheat flour, which can be dense. 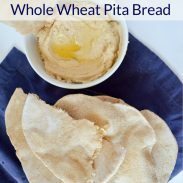 If you prefer less wheaty taste and texture, feel free to scale back the amount of whole wheat flour and increase the amount of bread flour. 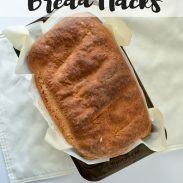 Before I share the recipe with you, I want to share some of my tips for how to make this bread its best possible. – While you’re kneading it, boil a pot of water on the stove. To get the bread to rise, put the bread and the boiled water in the oven (which should be off) together. This provides just enough warmth and humidity to really activate the yeast. – After an hour and a half of rising, reshape the loaf as desired (tall for sandwich bread, long for a baguette, et al.) on a pizza pan, and then allow to rise for half an hour while preheating the oven. – Once the timer goes off, I turn off the oven but leave the bread in there for a couple more minutes. I find this gives the bread a nice golden crust. Mix the honey into the cup of warm water and then sprinkle in the yeast. Let stand until the top is foamy - this will be about five to ten minutes. Start a pot of water to boil on the stove. Add all of the whole wheat flour to a mixing bowl. Pour in the yeast, salt, and 1 tablespoon oil; combine with a wooden spoon. Add the bread flour and mix until it forms a ragged dough. Knead the bread for 5-10 minutes, either by hand or with a mixer on a low setting. Add more flour or water if needed. (I always end up adding a bit more water, maybe 2 tablespoons or so). The dough is ready when it is springy to the touch. Pour the remaining tablespoon of olive oil into a mixing bowl; put the dough in the bowl and turn to coat with the oil Cover the bowl with plastic wrap. Put the bowl and the pot of boiled water into an "off" stove and let rise for an hour and a half. After an hour and a half, remove the dough from the bowl and reshape into a loaf on a pizza pan or other flat baking tray. Cover and let rise for another half of an hour. Meanwhile, preheat the oven to 350°F. Gently reshape the loaf again if needed, and then bake in the oven for 30-35 minutes or until golden brown on the outside. You can tell when it's done if it sounds hollow when you knock on the loaf. Remove from the oven and let cool at least 15 minutes before slicing. The loaf will stay good for at least five days if properly stored. I wrap mine in parchment paper and store in a bread box. You can also store it in the fridge. I know what I’m having for my afternoon snack. What do you do with the pot of boiling water? While preheating the oven, is the bread covered with plastic wrap back in the oven? There is some comment that says take out after a couple of more minutes (for good crust). Thank you. No – during preheating, the bread should be out of the oven. No plastic wrap during any phase of cooking the bread either.